Breeding Habitat: Dry deciduous or mixed forests, forest edges, forest openings; wooded edges of swamps, lakes, ponds, and streams. Diet: Small mammals such as shrews, mice, voles, squirrels; frogs, toads, lizards, snakes, large insects, some small birds. In the fall, Broad-winged Hawks migrate to Central and South America in large flocks (also known as "kettles"). The raptors in these flocks often number in the thousands and ride the warm upward-moving air currents called thermals. Each year, these raptors return to their previous nesting territory, but unlike some birds, they don't use the same nest. Instead they build a new nest or add onto an existing nest that was built by a squirrel, crow, or other hawk. 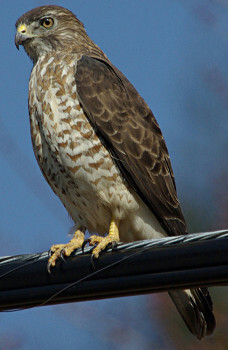 Raccoons, porcupines, and crows sometimes prey on the eggs and/or nestlings of the Broad-winged Hawk. 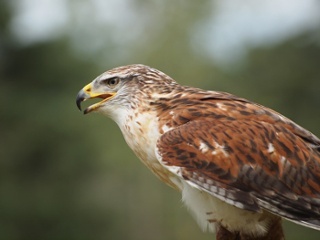 There have even been reports of adult Broad-winged Hawks falling prey to Great Horned Owls and eagles.